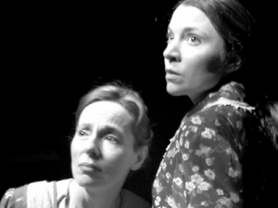 With Touchmark's powerful production of "The Glass Menagerie", director Douglas Beattie leaves behind the comedy of Dan Needles' Canadian Wingfields for the tragedy of Tennessee Williams' American Wingfields. Whereas Walt Wingfield chose to leave the city for the a life in the country, Williams' Amanda Wingfield's marriage to a salesman forced her to leave her home in the South and all its ways only to be stranded in an unfriendly city when her husband abandons her. Both characters feel out of place in their new environments, but throughout Needles' Wingfield series we do not doubt that Walt has found a richer life than he had in the city. Williams' Amanda Wingfield, a Southern belle who used thrive on gentility and attention, finds neither in the city around her or within her own home. "The play is memory. Being a memory play, it is dimly lighted, it is sentimental, it is not realistic.'' That is how Amanda's son, Tom, introduces the first in the long line of "memory plays" written in the 20th century. Tom is our narrator and also takes part in the action. For too many productions Tom's words become an excuse for an exercise in nostalgia. What Beattie makes clear from the outset is that Tom's memories of the mother and sister he has abandoned just like his father are tinged with pain and haunt him without respite. Tom may physically have escaped his family but they and his decision to leave them still dominate his thoughts. Beattie physically signals this darker, less comfortable vision of the play through his design. The otherwise realistic set depicting the Wingfields' miserable apartment is completely shaded in charcoal with only some furniture and clothing providing colour. Even before Tom's failure to pay the electric bill plunges apartment in darkness, Renée Brode masterful lighting has emphasized coldness and shadows. As a director Beattie eschews sentimentality. He also views the work as an ensemble piece not the star vehicle as it is usually presented. The result is that for the first time in my experience the Wingfields seem like a real family with deep-seated complaints and fears, not like a trio of actors thrust on stage together. This deepens the effect of the whole play since showing the strength of their unseverable bonds makes the tragedy of one the tragedy of all. As Tom the narrator, Eric Woolfe gives the sense that he replays this key incident in his past not out of choice but from inner necessity. The magic tricks Beattie gives him carry on the theme not just of theatre as illusion but of life as illusion. Woolfe makes him seem resigned to his burden of guilt. Within the action Woolfe carefully depicts the increasing severity of Tom's inner struggle between duty to his family and desire for his own freedom. Patricia Yeatman is superb as Amanda. From her first entrance appearing worn with care and defeated by life, we know this will be a more realistic interpretation. In her repetition of fond stories of her exciting girlhood, Yeatman gives the sense that Amanda knows that these memories are just a temporary escape from the present. Unlike other Amandas who are made to seem naturally optimistic, Yeatman shows that Amanda now has to force herself to be optimistic about the future because the only alternative is despair. When Amanda adopts her Southern belle pose for her dinner party, Yeatman makes us cringe with pity. The primary worry for both Tom and Amanda is Tom's sister Laura. She is both physically and mentally unable to function in the outside world. Her limp and her morbid shyness have made her seek refuge in the world of her collection of glass animals. Both Williams and Beattie make clear that hers is just the most extreme form of escape into illusion that characterizes all members of the family. Like the others Melissa Good avoids the sentimentality often emphasized the role. The distracted look, childlike voice, sudden changes of expression and her disproportionate fears show us from the beginning that this is not simply a delicate flower but a woman with severe problems. The kindness that the "gentleman caller" Jim shows her might seem to bring her to a state of normality, but when Laura's confidence allows her to show Jim her menagerie, Good chillingly shows us that Laura's obsession, far from quaint, verges on madness. Brad Loucks plays the one outsider, Jim, Tom's only friend at work, whom he brings home at Amanda's request as a "gentleman caller" for Laura. Loucks, too, shows his character in a different light. Usually the long scene between Jim and Laura is played as if it is Laura's menagerie that scares him off. Here, Beattie picks up the fact that Jim's fiancée is a "home girl" like Laura and makes Jim's attraction to Laura real. Holding out the possibility that in other circumstances Amanda's scheme might have worked both makes Amanda look less foolish and the tragedy more biting. Normally, Jim is played as if he is far from comfortable in the Wingfields' home. Lending Jim a certain underlying weakness, Loucks makes Jim's memories of his own, now vanished, once illustrious past and his hope for a future in broadcasting seem like another variation of the Wingfields' escapism. By relating Jim to the Wingfields Beattie reveals the Wingfields' tragedy as part of the general condition of humanity. Four excellent performances and Beattie's detailed, insightful direction make Williams' classic a compelling experience. How lucky Guelph is to have Touchmark call it home. Photo: Patricia Yeatman and Melissa Good. ©2003 Doug Mar.